Police said the killing was "vicious"
The mother of a teenage boy stabbed to death during an attack by a group of youths in north London has appealed for an end to gang violence. Martin Dinnegan, 14, was stabbed in the chest in Tollington Way, Islington, on Tuesday night and died at the scene. 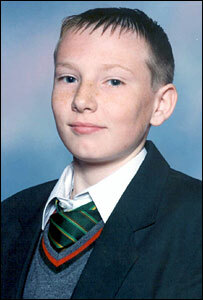 His mother Lorraine said the killing was "horrendous" and questioned how many more stabbings there had to be. Seven young Londoners have been killed as a result of either knife or gun crime in the last eight days. Mrs Dinnegan said: "I've just been speaking to one of Martin's friends and he says it's because apparently they were looking at each other in the wrong way." "Before he knew it, there were lots of boys fighting and he said he just looked and Martin was lying on the ground. "Why is it happening, why is it still happening? How many more victims are there going to be?" Detective Supt Richard Heselden said: "This was a vicious attack carried out in daylight on a busy street and we are keen to trace any witnesses we may not have already spoken to, or anyone who has any information as to who may be responsible." The death is the latest in a series of killings involving young people in London. On Saturday, 16-year-old Ben Hitchcock from Penge, south London, was stabbed to death in a fight involving up to 40 youths in Southend Road, Beckenham. Fourteen teenagers were arrested in connection with the incident and were later released on police bail pending further inquiries. Ben's murder followed the shooting of a 17-year-old girl during a fight at a bar in north London in the early hours of Saturday morning. Annaka Keniesha Pinto died in hospital after being shot in the Swan bar in Philip Lane, Tottenham. Three people were arrested in connection with the death and later released on bail.